Follow all the action from the German Grand Prix at the Nurburgring. 1517: And you will not be surprised to hear that Lewis Hamilton easily won the Driver Of The Day vote. Vettel still leads the championship by 77 points and they will do all of this again next week in Hungary. For now, the Red Button Forum is continuing on the er... Red Button and in the console at the top of this page, while you can read the report here. Right then, I've been dreading this moment, it's time to sign off for the final time. Thank you so much for your company and messages over the last few years, for putting a smile on my face, and for putting up with my nonsense. It's been an absolute blast and I've enjoyed every minute. Take care of yourselves, and each other. All the best. Speedwell68 on Twitter: "That pass that Lewis had on Alonso is going to go down in history as one of the best executed overtakes of all time." McLaren driver Jenson Button on Twitter: "Great job by Lewis and the team for another win! Tough day for me with a hydraulic failure. Had fun while it lasted!" 1510: It's probably worth a quick run down of the top 10, I should done that before. Sorry. Here we go: Hamilton, Alonso, Webber, Vettel, Massa, Sutil, Rosberg, Schumacher, Kobayashi and Petrov. Red Bull's Sebastian Vettel (4th): "It felt good to get out ahead [of the final pit stop] of Felipe, it was nice to see the Ferrari still stationary. I think both of us were right at the limit at the end of the race. I think fourth was probably our maximum today, which is not satisfying. We need to work harder on our car to get back on to the podium, and maybe on to the top step again. We have to accept that today other people were quicker than us, and surely I'm not happy, I'm not satisfied. I didn't feel too good all weekend, I never got to the pace Mark [Webber] had in his car." BBC F1 co-commentator David Coulthard: "That was unquestionably one of Lewis's best wins. That pass around Alonso, catching him napping, was the key to the whole race. Vettel didn't manage to pull a pass on Massa, he had to rely on the pit crew to do it. The jury is still out on his racing in traffic." Tom via text: "Thoroughly enjoyed turning up the volume on the TV in this Spanish bar and treating all the locals to a rendition of God Save The Queen! Great drive Lewis." 1458: Well that shows how much this means to the drivers, there's some tears from Hamilton when he is interviewed in the top three press conference. Bless. "We did not expect to come here and be so fast," he says. "I could not feel any better." McLaren boss Martin Whitmarsh: "What a fantastic race. You had three teams, three drivers, really battling it out. Lewis just drove a fantastic, fantastic race. We were very nervous all the way through to be honest. You never know if you can't get the tyre temperature up." 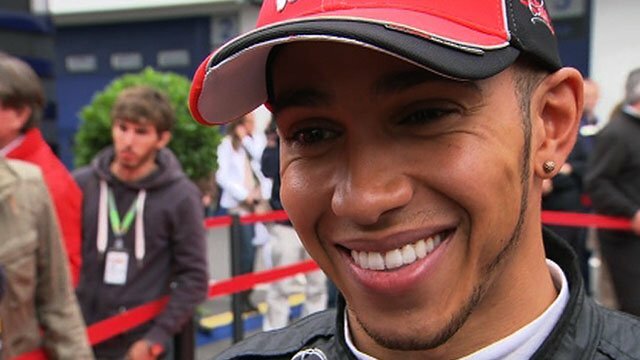 BBC F1 pundit Eddie Jordan: "Lewis was supreme. I did not think he could carry it through in the race. The key moment was when he passed Alonso on the outside of Turn Two." McLaren's Jenson Button on BBC Radio 5 live: "My start was pretty bad, I lost a few places on the first lap, that was tough to get over. Petrov was difficult to pass - moving when we're not supposed to move, in the braking zone. It's a pity to be out with a hydraulics problem but that can affect the gears and power steering so we had no choice." Ferrari on Twitter: "Fernando is the driver who scored more points in the last three races, a confirmation of the progress we made." Maxnot on Twitter: "Hamilton deserved that win. Some of his overtaking was absolute class." 1446: Fernando Alonso stops his car on the track: "We finish the fuel," is the call from the team. Handily, Mark Webber is on hand to give the Spaniard a lift home. Nice touch. Hamilton leaps of his car, through the barricades and into the arms of his team. He's happy I think. The top three walk up to the podium and Hamilton, with an enormous smile on his face, receives the ovation. Anthems. 1443: And Lewis has done it, that's his second race win of the season. "Fantastic job, fantastic race win, that was fantastic," Hamilton is told. Lots of fantastics there. A delighted Hamilton replies: "Great job guys, great job, that was amazing. If we keep pushing, this is the kind of result we can get. Thanks for pushing, guys." Lap 59: Well that was odd. Vettel almost runs into the back of Massa when the Brazilian brakes at the start of the pit lane. Massa is further down the line of garages and as Vettel comes out of his box before Massa, Ferrari cannot release their man. The German has got fourth, while Hamilton is cruising to victory. Lap 58: "Do the opposite to Massa, if he pits stay out, if he stays out you pit," Vettel is told. But Massa stays out and so does Vettel. Either he ignored that message or he didn't get it in time. It's a pit stop race now. Lap 57: Hamilton's advantage is now 3.4 seconds. "You are the fastest man on the track," his team tell him. Webber returns to third. Pit stop cat and mouse with Vettel and Massa, they are running together and they both need to stop. Lap 56: Webber now pits. By the way, remember our Driver Of The Day vote on the right hand side of this page. Lap 55: Fourth-placed Massa is still holding Vettel at bay, is the Red Bull man going to have a go at the Brazilian? Vettel is told: "Be patient. Be smart. These are good points today." Hamilton is 2.8 seconds clear of Alonso, this is his to lose now. Lap 54: It's worked out brilliantly for Hamilton. Alonso was not quick enough and the McLaren driver leads again. Webber leads but he still has to come in: "This is it now Mark," he is told. "Push now." Just six laps to go. Lap 53: Ferrari mechanics come out with the tyres on lap 52 but it's a bluff, Alonso stays out but then he comes in the next lap... this is crucial. BBC F1 commentator Martin Brundle: "This is the critical phase of the race now, this is where it will be won or lost. Are Ferrari going to punish McLaren for that early stop? As long as Alonso is quicker than Hamilton, they do not need to pit." Lap 51: Lewis Hamilton complains that his tyres are starting to go off... he's coming in. Lap 50: Hamilton's lead is now 2.0 seconds. Alonso is sensing blood. Lap 47: Vettel has got a shove on and he is the fastest man on the track after a setting a 1:34.587. He fancies fourth. Massa is told that information and that the gap between them is now 0.6 seconds. Lap 46: There's a good battle going on between Schumacher and Petrov for ninth, Petrov runs out of road at the chicane and has to cut over it, but Schumacher then takes the Renault driver up the inside of Turn One. Hamilton's lead has been cut a fraction, it's 2.9 seconds now. Webber is not making any ground, this race is down to two. Lap 44: Lots of radio communications now. Vettel, who came out behind Massa but is right up the back of the Ferrari, is told that his "brakes are OK, set brake bias for optimum." McLaren tell Hamilton: "The prime tyre is 1.5/2 seconds slower, we need to take this tyre as long as possible." Hamilton's lead is just over three seconds. BBC pit-lane reporter Ted Kravitz: "The final stint of the race will be fascinating - the harder tyre the drivers are obliged to run are so much slower than the soft they're currently on that someone - like Alonso, perhaps - could stay out until the last few laps before pitting. Alonso's tyres are coming in nicely now, so one option for Ferrari is just to sit in second, watch what Hamilton does and then try something different. Webber is likely to do the same, give or take a lap, but he's struggling with this set of tyres - Red Bull will be wondering where his pace has gone." Lap 41: Massa pits. Hamilton's lead is now 2.8 seconds. Lap 40: Vettel, in fifth, is hunting down Massa. The championship leader pits for another set of option tyres. He'll have to come in again before the end of the race. Lap 39: Alonso is closing the gap on Hamilton, it's now 2.9 seconds. This is not over. Webber, meanwhile, is dropping off, he's 7.2 seconds behind Hamilton. "He does not have the pace on those second set of tyres," says BBC commentator Martin Brundle. Lap 36: Button finally gets past Rosberg for sixth... oh no there's a problem... he coasts into the pit lane. "We have to retire the car, we have a hydraulics problem," he is told. Hamilton posts another fastest lap, a 1:35.063. Rosberg now pits. BBC F1 co-commentator David Coulthard: "Alonso was caught napping, he didn't cover off the outside, but Hamilton is incredible, he's in permanent attack mode!" Lap 34: Hamilton has carved out a 2.4 second lead over Alonso after setting a 1:35.117. Don't take your eyes off of this one. Lap 33: And now it is Alonso's turn to take the lead... he comes out ahead of Hamilton and Webber but the McLaren man does not know when he is beaten and he cruises around the Spaniard at Turn Two. Stunning. Hamilton leads. Lap 32: Lewis Hamilton makes it... but Webber is right back at him coming out of Turn One... the pair are side by side but the Briton keeps hold on the lead. Breathless stuff. Alonso now pits. I'm struggling to keep up. This is magic. Lap 31: Now Hamilton pits, where will he come out? Lap 30: Webber pits while Vettel is told that he is doing a good job with his rear brakes, "you can do two clicks rearwards if you need to." Lap 29: Webber leads by 0.8 seconds from Hamilton and the top three are covered by only 1.6 seconds. Brilliant. Alonso sets a 1:36.252. BBC F1 co-commentator David Coulthard: "The front three are so evenly matched. There is still a lot of racing still to run. The McLaren is incredible in the first sector, the Red Bull dominates the final sector and the Ferrari sits somewhere between the two." Lap 26: Trouble for Vettel. He is told over the radio: "We have a problem with the rear brakes, go forwards with the bias as much as you can." Lap 25: Button finally pits and he comes back out in eighth. It is Alonso's turn for the fastest lap, a 1:36.258. The leading trio of Webber, Hamilton and Alonso have dropped Massa and Vettel. Team Lotus technical chief Mike Gascoyne says rain is predicted for 30/40 minutes. That could spice things up. Lap 23: Webber also sets another fastest lap, a 1:36.532, but Hamilton's time is very close to that. Matching him blow for blow. Lap 21: Webber's lead has increased after he sets a 1:36.551, the fastest lap of the race so far. Sutil pits as Petrov is a sitting duck for the likes of Massa, Vettel and Rosberg. He's down to 10th. BBC F1 co-commentator David Coulthard: "Vettel is not at one with his car. He just doesn't seem settled at all, and with that the confidence goes." BBC F1 pit-lane reporter Ted Kravitz: "Mark Webber gained the lead of the race courtesy of what's called the 'undercut', which is when you pit before your rivals to use the speed benefit of new tyres. Webber exited the pits into traffic but once he cleared Adrian Sutil, it was lap 16 that proved crucial. Webber did a 1.37.003 on that lap and that was enough to pass Hamilton." Lap 19: Storming lap from Hamilton. He sets a 1:36.718 and is 0.8 seconds behind Webber. Alonso is third. Button has finally got past Petrov after a long battle with the Russian, the Briton is running in fifth but has not pitted. Lap 17: Wow. They come out as Massa and Webber come down into Turn One. It's worked out perfectly for Webber, he effectively leads now. Hamilton and Alonso are close behind. Massa pits. Lap 16: Webber was in a little bit of traffic but he's free of Sutil now. Can he make up the time as Hamilton, Alonso and Vettel pit? This is going to be tasty. Lap 14: More action at Turn One. Massive lock up by Webber but he manages to fend off Alonso. Webber pits. Lap 13: Hamilton is straight back at Webber along the start/finish straight. This is superb. And he regains the lead at Turn One. Racing at its very best. Here's Hamilton on the radio: "Could you stop talking to me while I'm racing!" There's no answer from McLaren's team. Probably for the best. Lap 12: This is a massive battle at the front. Alonso is closing in on the front two. This is going to be a thriller. And Hamilton runs wide at the last chicane... Webber is beside him... he's taken him on the final corner. Webber leads. Lap 11: Big shunt between Buemi and Heidfeld at Turn 10. Heidfeld's race is over. He's in the gravel so no safety car. BBC pit-lane reporter Ted Kravitz: Felipe Massa's engineer was absolutely right, Massa was losing over a second a lap behind Rosberg's Mercedes. He should be well capable of doing a 1:38 but now he is past Rosberg his race will not be as ruined as it might have been." Lap 9: Something has happened to Vettel, he has lost a load of time and Rosberg is up the back of him. And there we see it, he touched the white line coming down into Turn 10 and that's a big spin. Lap 8: Alonso is fired up. He comes up the back of Vettel into Turn One and nails third place. Vettel had no answer to that. "Vettel has been wearing a heavy demeanour this weekend," says commentator Martin Brundle. "He has not looked as confident as he has been this season." Lap 5: Another fast lap from Webber, Hamilton's gap is now 1.2 seconds. Meanwhile Massa, in sixth, is getting the hurry up from his race engineer Rob Smedley. He wants him to get past Rosberg. "You are much quicker than him," says Smedley. BBC pit-lane reporter Ted Kravitz: "After a poor start, Jenson Button is badly being held up by Petrov's Renault, and he is now almost 14 seconds behind race leader and team-mate Lewis Hamilton. McLaren will be thinking about pitting Button early to get him some clear air." Lap 4: Alonso is struggling again, he runs wide but does not lose too much time. "He has a lot of understeer," says Coulthard. "There is a lot of fuel onboard and maybe he is struggling to get heat into his tyres." Webber is now flying, he sets the fastest lap of the race, a 1:38.189. Lap 3: Alonso up the back of Vettel's car into Turn One but he's not close enough. The rain must have stopped, DRS has now been enabled. Hamilton leads by 1.9 seconds. Lap 2: Hamilton leads by 1.2 seconds, he's up for this. Hang on, Alonso gets it all wrong coming in to Turn Three and runs wide. Vettel comes up the inside and takes third. Alonso will be fuming with that. Just having a replay of the start, that really was a poor one from Webber. Lap 1: Great start from Hamilton, he leads into the first corner. Brilliant stuff. And Vettel is squeezed out by Alonso. The German fights back but Alonso is able to hold on. Game on. Red Bull team principal Christian Horner: "It's going to be a fantastic race, I think, and a bit of rain in the air makes it more tense! Mark and Sebastian are free to race and they know that - we just want to avoid a situation where we could lose a lot of points unnecessarily. There will be rain for sure at some point, and the radar won't have the answers as to when - it's very local here, and we have spotters posted around the track." 1302: The cars line up. They are ready... are you? GarethHowell on Twitter: "This could be the most interesting start so far this year." 1259: I can't see every car but it looks as if the vast majority of them have not gone for intermediates. It obviously isn't raining enough. We'll see if that is the right decision. Here we go, the cars sets off on the formation lap... not long now. 1257: It is raining a little heavier now. Big moments for the team strategists. The track has been deemed wet enough for the drag reduction system to be disabled. BBC F1 pundit Eddie Jordan: "This is a big test for Mark Webber, he never really capitalises on those pole positions he has had. Hamilton will be massively aggressive, Red Bull less so, so I think Hamilton will win." BBC Sport's Sarah Holt at the Nurburgring: "The teams discussed the return of in-season testing on Saturday night at the Nurburgring. The practice was stopped in 2009 to help cut the sport's running costs but there is now talk of a one-off three-day test in 2012. Jenson Button might just give that plan the thumbs up as the McLaren driver spent most of Friday trialling a new rear wing and a mystery part, which malfunctioned and ended up cutting his afternoon session short. Button qualified in seventh while his team-mate Lewis Hamilton is second. So did testing hurt his preparations for the weekend? 'It would be easy to say yes right now,' said Button. 'We do a lot of testing on Friday because there's no in-season testing. It's a useful time for his to compare components. I just wasn't quick enough in qualifying but it's not because I was busy trying different things in P1." lath8ury on Twitter: "I'm hoping JB storms up the field from the start, should be a great race!" georich17 on Twitter: "Rain at the Nurburgring will mean an excellent GP. Here goes!" BBC F1 pundit Eddie Jordan: "You see those guys at the back of the grid, these conditions are their dreams coming true. Anything could happen, and one of them could come through and win this race." Team Lotus driver Karun Chandhok [replacing Jarno Trulli, starting 20th on the grid]: "My last race was Silverstone last year, exactly one year ago. It's just started spitting, though it's still slicks - but there's no track temperature, it's pretty hideous. The longest I've ever done on Pirellis is 10 laps, so once again, God's dealt me some pretty tricky cards!" 1243: Brundle is out and about, and there's spots of rain on the camera lens. It is raining. This is going to be tasty. Brundle tries to chat with Daniel Ricciardo but he's got his helmet on, no joy there. Wonder if Michael Ball has flown over for the race and is on the grid? Jaime Alguersuari is interviewed and he says: "It is very difficult to get front tyre temperature, it is very cold and it is starting to rain." By the way, Alguersuari's Toro Rosso team-mate Sebastien Buemi will start at the back of the grid because of a fuel irregularity. BBC Sport's Sarah Holt at the Nurburgring: "Virgin Racing HQ was a hive of activity this morning as Timo Glock finally put paid to speculation that he was unhappy driving for the fledging team by signing a new three-year deal. Glock is cheery chap, who occasionally likes a good moan, but he reckons that after a race toiling at the back he simply resets his head and gets ready to go for the next one. The German also had an interesting take on driving in chilly conditions at the Nurburgring, saying he once turned up for a race here in May and the track was covered in snow!" 1236: Martin Brundle's gridwalk. Ace. The track seems dry, but DC has mentioned that the rain has just started to fall. Just had a a quick straw poll in the office about who is going to win and we have five difference answers, which sums up just how open this race is. There's votes for Button, Webber, Vettel and two for Hamilton. I won't tell you who has gone for which driver unless they get it right! calum_costello on Twitter: "Chance of rain, Vettel off pole, low temp. All lead to an exciting race. There, I've jinxed it now, let the two hr procession commence!" Anon via text: "The McLaren seems to love these cold temperatures and slightly moist conditions. I'm thinking Hamilton is actually odds on favourite for the win today, there looks to be so much speed in his car." Ferrari team principal Stefano Domenicali: "The conditions today are quite tricky - you know we don't love these kind of temperatures too much, though it's great for the show. But I am thinking of Fernando's win in Silverstone. You can see Fernando has the same approach of for example Michael [Schumacher]. He's living with the team, he's pushing very hard, but in the right way." 1227: There's a great video clip of Fernando Alonso talking with Lee McKenzie about the championship and then impressing her with a card trick. It's a pretty good trick, to be fair, and there's a broad grin on the Spaniard's face at the end. He enjoyed that. Here's what he said: "At the moment it is difficult to think that anyone can recover the gap [to Sebastian Vettel], to be honest and realistic. Sebastian did a fantastic first half of the season and with the amount of points he has, with a normal second part of the championship, it is easy for him. But this is F1, so anything can happen. We will not give up, we will take it race by race try to win races and try to enjoy Sunday and if he does any mistakes, or if he has a bad period, we will try to take the benefit of that." By the way, if you manually refresh this page, the video of Lewis Hamilton will be the proper size! Ta. BBC Sport's Sarah Holt at the Nurburgring: "Williams are carrying out an interesting experiment with Rubens Barrichello's car this weekend. The Brazilian is not running with the Kers energy recovery and power boost system, which can give drivers an overall lap-time advantage of about 0.3secs. The team say harvesting the power under braking upsets the balance of the car and they want to see if taking it off will help them make their tyres work more effectively. A lack of Kers could explain why Barrichello qualified just behind his team-mate Pastor Maldonado in 14th." McLaren team principal Martin Whitmarsh: "It's clear in terms of slow speed corners the car is strong but that we've lacked a bit in high speed corners in respect to our friends at Red Bull. We can clearly win the race [in these conditions] but we can also get it horribly wrong. There is a weather front here, and it is clearly going to be wet at some part of the race." 1221: Hamilton was like one of my children after a thrilling funfair ride yesterday as he delivered "one of his best laps" in qualifying. I wouldn't be surprised if that smile was on his face even in his sleep last night. "I can't remember coming across the line in a qualifying session feeling so ecstatic and feeling so energised," he said. "It was as perfect as I could do. I don't know where I found the 0.4secs to split the Red Bulls." 1218: McLaren boss Martin Whitmarsh is on the telly now and he predicts the drivers will start on the intermediates. "It will be wet for some parts of the race", he says. liamchad on Twitter: "I predict a real racy start and first lap for Hamilton today, he has nothing to lose really." 1214: Another stat for you, in the 14 races held at the Nurburgring since 1995, only three winners have come from pole. Michael Schumacher in 2001 and 2004, while Webber stormed to his first F1 victory in 2009, despite having a drive-through penalty. BBC Sport's Sarah Holt at the Nurburgring: "At the age of 15, Sergio Perez left his home in Mexico and moved to Germany to compete in 1982 world champion Keke Rosberg's Formula BMW team. It was an important first step on his way to becoming an F1 driver. 'It was difficult for me to leave my home,' said the Sauber driver. 'I came totally alone to a village called Vilsburg in Bavaria. It's so small I don't think it's even on a map!' And does Perez remember any German? 'Ich bin Checo and alles kaput, which means all is broken,' he laughed. Perez scored his best result of the reason at the last race in Silverstone, where he finished seventh, and he hopes that more rain at the Nurburgring will help him to more points on Sunday from 15th on the grid." stephenmartin89 on Twitter: "Sun, Formula 1, Guinness, doesn't get much better for a Sunday afternoon." BBC F1 pundit Eddie Jordan: "The McLaren boys have to go for every opportunity they can get, they have nothing to lose." 1209: It's a half length light beige coat for Eddie, and David Coulthard is matching the colour with his clothing. No trademark white jeans for anyone today, not in this cold. BBC Sport's Sarah Holt at the Nurburgring: "Mark Webber is starting on pole position for the third time this season in Germany and the Australian has had plenty of people reminding him what happened when the lights went out the last two times. At the Spanish Grand Prix, he was overhauled by Ferrari's Fernando Alonso and at the last race in Britain he was beaten off the line by his team-mate Sebastian Vettel. But Webber loves this track, winning his first race here in 2009, and a damp track could help him defend his line going into the first corner. 'I'll be in there pushing hard, don't you worry,' Webber told his doubters." Anon via text: "Another poor start for Webber... Vettel and Alonso first corner incident... Hamilton to streak away." rvdavemagee on Twitter: "Looking forward to the German GP. Should be a cracker, I think the weather will play a big role in the race. I think a McLaren 1-2." Williams F1 team: "Dry is drying but more rain is on the way before the race... watch this space!" Mercedes GP on Twitter: "Just had a very contrite David Coulthard in the office after spinning our priceless W196 car on a parade lap and nearly taking out Mika!" 1158: I know you like your facts, and my esteemed boss Andrew Benson and I were looking around yesterday for some gems to keep you going. Vettel has only won two grands prix that he has not led into the first corner. That was Abu Dhabi in 2009, when Hamilton jumped him off the start, and Spain this year, when Alonso blasted through from fourth. And another one, third place on the grid (in Malaysia last year) is the lowest Vettel has come from to claim one of his 16 race wins. 1153: It has been raining in Germany overnight and this morning, it is drying out at the moment but showers are forecast for the race. We'll see how heavy they are, shall we? I doubt they will be as heavy as in 2007 at the Nurburgring when we had wacky races early on in the European Grand Prix with a host of cars, including Lewis Hamilton, flying off into the gravel trap at Turn One. BBC Sport's Sarah Holt at the Nurburgring: "Ferrari driver Fernando Alonso brilliantly described the cold conditions here as 'not a friend to us'. The cool track temperatures did him no favours in qualifying as he could only manage to claim fourth on the grid. Ferrari recognise they have a problem when it comes to getting their tyres up to optimum temperature, but once they get them working they are able to use their rubber more efficiently than their rivals. That means Alonso should be more competitive during the race than his qualifying position shows, which is exactly what happened when he won the last race in Britain." JoshBlatchford on Twitter: "F1 prediction: 1st - Vettel; 2nd - Webber; 3rd Hamilton." hallster79 on Twitter: "Expecting a cracking GP today. Unpredictable weather and battle royale between Vettel and Webber! Doesn't get any better." 1144: This seems like a good time to remind you about where you can watch/hear the action today. Telly coverage begins on BBC One at 1205 BST with BBC Radio 5 live getting going just before the start of the race at 1300 BST. All of that will be streamed in the console at the top of this page, which will also include our driver tracker feature. Remember that we also have the Driver Of The Day vote, which can be found on the right had side of this page underneath the leaderboard from when the race starts. Choose the driver you think has been the best and then, er... vote. Simple. The vote will close when BBC One coverage comes to an end at 1520 BST. Is that everything? 1138: Emotional scenes at BBC Towers today, and no, it isn't because I'm still a little giddy after seeing West End's Michael Ball in a petrol station last night. Today is my final live text commentary for the BBC so please try to contain your joy at reading that and please do get involved in this commentary. Predictions, hopes and fears for today, you can even wish me good riddance. You know the drill by now, get involved via Twitter (via hashtag #BBCF1 ), you can message my direct via @markorlovac or you can text me via 81111. As there is a bit of cricket going on today, could I ask you to start your message with F1 so I can see it? Fab-o. sorry I mean the German Grand Prix. Here at BBC HQ we have been huddled around a tiny, fan heater because this may be mid-summer but temperatures have been hovering around 10C for much of the day. The Nurburgring with its undulating mix of fast and slow corners provides plenty of challenges but these cool conditions have added an extra conundrum for the drivers to solve. To make matters worse, the team radars show there is more rain around. All this is hardly surprisingly because the circuit - built to replace the legendary Nordschleife track - lies prone to the capricious climate of the Eifel mountains and is the second highest stop on the F1 calendar behind Brazil. All that should make for another thriller, though, right?" 1130: Just when you thought this title race was over... championship leader Sebastian Vettel qualifies in third, Mark Webber grabs pole, while Lewis Hamilton splits the Red Bulls with a stunning lap for McLaren to put him right in the mix. We have a battle on our hands people, no doubt.